Volumes 3 and 4 of The AVENGERS: Earth's Mightiest Heroes! have arrived! 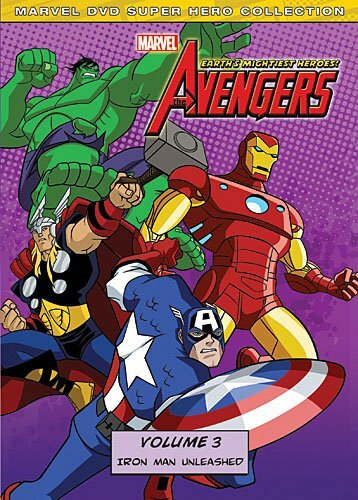 I reviewed The AVENGERS: Earth's Mightiest Heroes! Volumes 1 & 2 back in May, and since Volumes 3 and 4 are just a continuation of the same series much of what I wrote in that review also applies to these new releases. These two volumes finish off the first season of what turned out to be a great animated television series, so now those of us who missed this show on television can finally see what happens. One of the great things about this series is how human all of the characters seem, even with all their special abilities. Every major person in here have their own unique attitudes, beliefs, quirks, and character flaws. For instance, in the previous volumes Hawkeye ends up being hurt emotionally by someone he really cares for, and this really shows throughout the rest of the show; you can see the struggle within him not just from his actions and what he says, but also from his voice, his facial expressions, and his body movement. You can see the same type of struggle in pacifist Hank Pym whenever he must battle, so you can tell the producers of this show really put a lot of effort into getting these characters to feel like real people, and not just super heroes. Another good thing about this series is that it's not just a bunch of stand alone episodes of The Avengers saving the world from one strange evil plot after another; there is a continuing story throughout the entire season which lets us get into much deeper plots than would be otherwise possible, and makes the show feel much more like a graphic novel. In this second half of the season, we get to see the Masters of Evil, a group of super villains sort of like the anti-Avengers, plus the Fantastic Four stops by in a couple episodes, and several other characters from the Marvel Universe, both good and bad, are introduced. The extra features on these discs consist of something called "Avengers Unmasked". This is basically like a "fun facts" thing where the episode plays and facts are shown on screen about what's going on in the show, but it's a little different than your typical fun-facts because the screen is made up to look like a comic book panel and the episode plays inside one of the panels where they rest of the panels show artwork from both the show and from the comics, and it's constantly changing throughout the episode. Each disc has one of these Avengers Unmasked extras. On volume 3, it's "Avengers Unmasked: Masters of Evil" and on volume 4 it's "Avengers Unmasked: Hail, Hydra!". I enjoyed both volumes and would definitely recommend picking them up.